Start your skincare journey with Beauty Above… We believe we have the answer to change your skin for the better with our fantastic range Environ and Advanced Nutrition Programme. Prominent Cape Town plastic surgeon Dr Des Fernandes was a pioneer in being one of the first to use Vitamin A to ensure a genuine visible effect on the quality of the skin. The introduction of Vitamin A into skincare formulations was a groundbreaking development, because it offered benefits to sun damaged skin. Through this research, he discovered the essential role of Vitamin A in skin health and he became determined to create a range of skincare products that would maintain healthy skin. 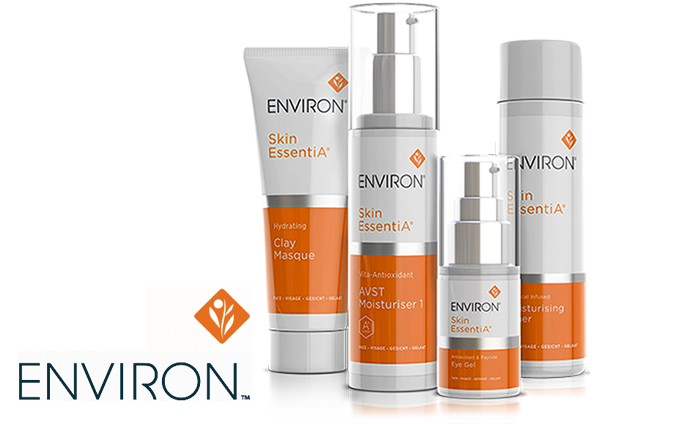 Out of this the Environ company and skin range was born. The scientifically proven efficacy of its products makes it one of the cult favourites among those in the know. Environ is acclaimed by international beauty editors, skincare therapists and dermatologists alike. Packed with nourishing, anti-ageing ingredients, the Active Vitamin Treatment will leave your skin looking radiant and dewy. The freshest, most active forms of vitamin A, C and antioxidants are drive deep into the lower layers of the skin using soundwaves and small electrical pulses. The scientific approach stimulates collagen to soften lines and improve elasticity, increase hydration and boost radiance. This facial is suitable for all skin types and is particularly effective at addressing sun damage, pigmentation, premature ageing, dryness, uneven skin tone and scarring with measurable differences after just one facial. This peptide-packed facial helps to boost collagen, soften fine lines and tighten lax skin, resulting in a more youthful appearance. Ideal for targeting mature or photo-damaged complexions. The treatment uses gentle sound waves to drive a special nutrient-packed serum deep into the lower layers of the skin. The formula contains a unique combination of three peptide complexes which work in synergy to give the skin a plumper, more radiant appearance. The perfect antidote to dry, lacklustre skin, this intensive treatment deeply hydrates while plumping and firming the skin. Based on Hyaluronic Acid, which holds 1000 times it own weight in water, it helps to reduce fine lines caused by dehydration and increase the plumpness of the dermis, resulting in moisturised, glowing skin. The Environ Ionzyme DFII machine is the first to combine the use of active Sonophoresis and intensified Iontophoresis. This unique combination of gentle pulses and sound waves along with the active ingredients enhance the vitamin penetration by 4000%. It is driven deep into the skin to help soften lines and reduce pigmentation marks.